The American market is very different to the Australian market. If I was to tell you that I could find you an investment property with a 14 % net return you would laugh and walk away because I would sound too good to be true. But in the American market 14 % net is actually something that’s quite easily achieved and there are investors who are achieving above that 20 %, 30 %, 39 %, 40 %. The American market is very different than the Australian market and can offer great cash flow for investors who know what they’re doing. 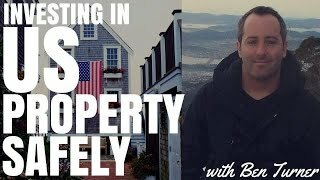 Today I sit down with Ben Turner from on iPropertyInvestor.com.au and I talk to him about his investments in the US. So we talk about the steps that he took to invest in the US market, why he went ahead and did it and some tips for guys and people like you who maybe consider investing in the US markets. So now over to the interview with Ben Turner. Ryan: So now let’s go into your ventures in the US property market. So how many properties do you now own in the US market and what success have you found in the US market? Ben: Well at the moment I own two properties with my business partner so we share this 50/50 the moment so we’ve got one each. We’ve boarded in the name of LLC- limited liability company. It’s a bit like a Proprietary limited company in Australia so that’s a structure we’re using to buy the properties and we’re obviously just the company directors. We purchased two in Kansas City in a working-class area, we’re looking to purchase more there, I’m shooting over there in April to have another look around and cut some deals. In the moment it’s just the two. Ryan: What made you go into the US market and talk us trough your decision process from saying ‘okay well I’ve had some success in the Australian market, now I’m going to go look at the US’ so talk us trough your decision process and then after that we’ll have a look at how you got set out with LLC and that sort of thing. So why did you end up going after that, what research did you do? Ryan: I think that Australian investors need to know that the US property market it’s not something you can just go into willy nilly, invest and you are going to make.. you are going to get rich quick or something like that. You need to do your research just like you would in the Australian market and you need to be on the ground or have people on the ground that know the area, know the market. Because it is a little bit different than the Australian market, the way properties and managed and so forth like that. It is not the same cattle of fish. I think that Australian investors need to know that they need to approach it differently and they need to either work with people over there or like you did find the success stories and mimic them yourself. So how did you then go… okay you’ve heard some success stories, now I’m going to go and invest in the US market. Did you fly over or did you have a team over there? Ben: Now what happened was I got chatting with Angelo Rumora he is on PropertyInvesting.com forum sometimes but I got to know him, he’s Australian investor who moved to the States to Kansas and he’s actually been living there for about 8 months now. He has also got another business partner called Mark Rooney who runs ‘Invest in US’ group. I’m not giving these guys a plug or anything, I don’t work for them or anything I’m just… this is a company that I use and I had to sit down over a few emails, I got to know Angelo a bit and they just seem what they are doing seem legit I wouldn’t be having the issues that we’ve spoken about. So I had to sit down with them about twelve months ago. Gloria James had a coffee, had a really good chat, meet out with them through.. and then I met up with Mark a few more times for a chat and just looking at the results I had and speaking to some of the other clients that they had an just everything seemed to be really good. They had the rock-solid property managed on ground, they had the rehab team, everything was set out nicely and the thing is the fact that there was an Australian guy which is Angelo over there, keeping on eye. If you had a drama Angelo could just, all you need to do is call him or email him and he can jump up, carry around and sort it out. That’s what attracted me to Kansas as well. A lot of Australians will talk about “you know, have thought about Las Vegas, have you thought about L.A or Florida and all this” and my argument to them is “look I’m not really interested in a specific area because of growth potential or whatever, for me it’s about, I was slightly interested in Kansas city but the fact that I actually met some Australians who are sort of walking the walk and talking the talk was the reason that I jumped on board with them” and that’s what encouraged me. If you know someone who’s doing successful in Florida why go to Detroit and try reinvent the wheel you know? Ryan: Well that’s the thing, especially coming from Australia and not knowing, most investors wouldn’t know the US market at all so to just go off the latest hot tip or ‘this area is good’ or ‘that area is good’. To me I just think it seems crazy. Like I’ve got a friend who just moved to Silicon Valley because he is in Tex, he started the Tex company with millions and funding and so forth and the difference between one suburb to the next even within San Francisco, living on one side of the tracks versus the other, someone could say “oh San Francisco is a great spot but whereabouts because some areas are really dodgy and some are really good. So I think what you said having a team on the ground to help you, someone who knows the area someone who can do management is going to be pretty vital to any Australian who wants to go over there. Unless you are going to go probably live there yourself. Ben: Absolutely. So then I started just buying turn-key properties which is just mainly rehabbed and it is always tenanted, I never buy one that is untenanted, that always got have a tenant and be ready to go and then I use a property management company there which again I got these contacts through Angelo as well. And then it really had my best interest, these guys they don’t make money off my back from, hooking me up to ‘I simply property management’ which the company that I use there. It’s just that, they want to just look after Australian investors, they got aftermarket sort of service. So you buy, I bought some rehab properties through them I and I did much due diligence with that, evaluations and everything, it all came on board so it wasn’t like a lot of horror stories we heard for five years ago. People buying houses in Detroit that will worth $5, 000 and paying 55 for them you know what I mean? Some of those unscrupulous companies… So you know I did as much as I could on the on the ground here, I know it’s not ideal and a lot of people would bark at the idea of **** off but when you think 2,5 grand to get there and then if you end up with dodgy property management team it just can be sort of waste of time so I actually use… what I’m doing is sort of litmus test . I thought I’m going to buy 1 or 2 trough these guys, I’ve got into this at the network, I use the attorney they put me onto and some property management team and of middle these other people, through them. So now, I can sort of shoot over there and then I’ve sort of got their team as well now, you know what I mean? Ryan: You’ve got this network over there and I guess a team that helped you to accumulate and do when you go out there in April you’ve got all this people that you can connect up with and you can get a lot more done. So you are not spending 2,5 grand to fly over there and laying on the ground and have no idea what you are doing and just going from ground zero. Hey guys, I hope you are enjoying this interview with Ben Turner where he is talking about investing in US property. We have more great content coming up but we’re just going to take a second to hear from our sponsors. Investing in property in the US has proved to be successful strategy for many Australian investors. Bes selling author and property investor Steve McNight has recently been investing in the US property market. The US property market can provide Australian investors with rental yields unheard of in Australia. We’re talking 20%, 30 %, 40 % or more. But trying to go at a loan in the completely different country is a recipe for a disaster for most investors. Coal and Eleen from Blue Horizons Property are helping their clients invest in properties in the US with up to 39 % net rental yield. With investment starting for as little less as $33, 950 and rental income supported by some of the world’s largest oil companies this can be a great way to get your feet wet in the American property market. Visit NorthDakotaOilHousing.com or call Coal on his personal line which is 04 09 455 604. Ben: It just depends on what you want to do. I’ve heard of some Australians even trying to rehabbing stuff from back here which I wouldn’t recommend at all because of the situation. Obviously I’m working, I’m back in Sidney, I want the stress of trying to rehab properties there or anything like that so I’m happy to buy turnkey properties that are tenanted, good to go. So essentially you are looking anywhere between minimum $35-40 000 US. This is for an $1,000 you can obviously still buy $5, 000 houses in run-down neighborhoods if you still want to but I think you are asking for trouble but that is more like lower-middle working class sort of area and obviously the sky is a limit. There are still houses there that run up to the hundreds of thousands of dollars as well. But typically, my business partner Adrien and I, we tend to look for properties price sort of around $35-40, 000 US up to probably $50-60, 000. That’s what we are looking at the moment and we’re looking to purchasing more ones, we’re shoot over there in April. And rental yields that we’re getting at the moment, so we are actually getting these, we haven’t had a month miss rent yet. I bought my first one mid last year and I get my rent check every month into the account. And then we bought a second one late last year and the rental yield that we’re getting are about 14% rental return. So I think gross is about 20% minus your property manager fees, your rates, school taxes and things like that so you’re looking at about…so our ****is minimum 13,5 % net rental yield, that’s a minimum that we’ll take. Ryan: Yeah, well that’s pretty significant and it would be really hard-press to find a property in Australia that’s giving you a 20% gross rental yield. Can I just ask, why are this houses so cheap in the US, how can you get a house for $40, 000, doesn’t it cost more than that to actually build the House? Ben: Absolutely… I mean, thisprices are typically halved in price so during their peak they were probably around $80-90, 000 and as probably are some of the viewers are aware, there was a credit crunch in the US where pretty much banks have just stopped loaning. ***they were loaning too much money to subprime mortgages which is just…mortgages were needed the paperwork to back them up- paperwork to back them up like payslips and thing like that to prove that you could make the repayments and that is obviously how this sort of mess happened. I don’t see…it’s essentially to me artificially to fade it because the credits dried out, that’s how I look at it anyway. So, that’s the only thing I can put..and obviously because there is a lot of repossessed homes and the banks are holding them all and then the bank releases them about every month or two I notice, onto trulia.com which is their realestate.com in Kansas anyway. So what then happens, I watch a stock on market go down and I think ” okay, this is a good thing because of you know-supply and demand” but then within a month or two they release like another couple hundred onto the market in that are so..The banks are holding large amounts of repossessed properties and mine stand is ***into the market every few months in large numbers so what that does is that it keeps prices down. It’s that Australian mentality of growth and they are always “when is the growth, when do you see it happening” and they are focused on that growth focus because in Australia- Australia is what I call a one-dimensional property market. Really it’s a growth market, that’s how we make our money in Australia because even when you call yourself a cash flow positive investor you are not making substantial amounts of money, you are making enough to cover the rent, cover the mortgage, repayments, rates and then if you are lucky there is a little bit left over, maybe $20-80 a week if you are lucky. To me that is not enough to live on and when you add up the deposit for your house and things like that to get that property is it worth? I seduce the Australia is really a growth focused market because that is the only way we can essentially make money here an even people who are holding cash flow neutral, cash positive properties what they are holding up in Australia is growth. That’s how I see it anyway, other people might see it differently. Whereas in the US, because the rental yields are so high I don’t even worry about the growth because I’m not going to try and predict it. If I’m getting a 20 % growth rental yield it means essentially I’m getting my capital investment back within about five years for the total of the property. A 100 % return on my money in five years just from cash flow. So to me the focus, I don’t worry too much about a growth. I do believe that it will come back whether that’s 5 years, 10 years, who knows. But yes, my strategy is certainly a cash flow strategy in the States. In Australia obviously I’m ****. Ryan: So, to have your money back in five years, that’s a pretty good achievement to have because you can then take that money, you can reinvest it-either back in the US market or into the Australian market. Let’s just touch on if someone did want to go ahead and do it and look, I still recommend that people have teams and do a lot more research than just listen to this podcast. But from my understanding you would have to have the money in cash and then you would have to set up a company in the US. Is that how it works? Ben: Yes, essentially that is how it works. You can’t buy things on your own and there is other structure **but the most***future**everyone will tell you***LLC which is limited liability company which is as I talked to you before Proprietary limited company in Australia and you are just buying in the name of the company. And people do that for a number of reasons as a protection and it’s probably the best structure*** in a partnership if you are going to join eventually with someone because there is operating agreement that lays in everyone’s interest and rolls within the company. Ryan: Yes, so it protects everyone. So I’m guessing that a lot of Australian investors are borrowing money against the equity in their Australian properties and then taking that money across to the US and investing using that cash. Is that right? Ben: I was just going to say, I’m starting to hear stories of people getting financed, like on the property forums. But typically, if you are buying commercial property(this is what I heard on property forums from the guys that were doing it) you can’t get up to 70% loan value ratios with commercial property, with residential. Angelo and Mark Rooney, the guy who ***they can get what’s called money lenders or I call them secondly lenders, they are not bank expertise, there about 30 lenders really. But the interest rates are obviously much higher and they will do 50% LVR, that’s what I’m told anyway from them. There is a company called I think it’s Peak Finance in Kansas City and that’s what they are doing but they typically want about 10% interest so is it really worth your time for a 50% LVR? I’m going to go and see these people over there, I’m going to go and see the bank and clarify some thing when I’m over there. It’s definitely starting to ease up a little bit, I think it’s going to get better as we go along in next few years, with credit for foreign investors. Ryan: And with the set up of LLC is that an expensive thing to do if people want to go ahead and do that? Ben: You can actually do it yourself believe it or not online. I wouldn’t recommend that, I think is $150 or couple of hundred of dollars if you do it yourself but it is sort of unsheltered territory it forms, you haven’t seen it before and it’s a little bit confusing so I use my attorney in Kansas. Just another tip you have to actually set up the LLC where you are going to buy the property so you can’t set up LLC in Florida and buy a Kansas City property. You can try but you’ll get penalties, I can’t remember what, someone told me. But essentially you get found. You have to have LLC set up in the state you are investing in. Ryan: If you are going to buy in a certain state then set up your LLC in that state and get probably US attorney to help you with the forms because realistically they are probably not going to look nothing like the form we are used to in Australia. Ben: Yes, and they are not as friendly as us in Australia, a lot of here-government agencies, ***websites, everyone is friendly whereas I noticed is the US is not the same. Some of their stuff is quite confusing. I got my attorney set up, out the forms from memory, about $7, 000 and he did everything-filling out the forms and he send it to us and we signed them and send them back and things like that. Ryan: So that’s not too much money to go ahead and set it up, it’s probably cheaper then setting up Proprietary limited company in Australia, I’m not sure what are costs of that. Are there any other tips that you would give to listeners who are thinking about investing in the property in the US or you think it’s too big topic to cover in one podcast episode but I think just getting your experience and those couple of tips have been really helpful but is there anything else that you would say “well this is important, people need to know this”? Ben: All I can think of is read as much as you can, there are a lot of books now coming out from Australians who are investing in the US, I believe there is two at the moment. You can jump on Amazon Kindle, I downloaded them and have read. I don’t know the guys or anything but their books I find very helpful, certain property investment forms get on there. That’s about the only advice I can give. I’ve got links of contacts in Kansas City on my blog which is iPropertyInvestor.com.au, it’s there, theirs phone numbers their emails, whatever, you can do with it what you are pleased. If you want to use them or whatever that’s fine too. Ryan: So, that’s at iPropertyInvestor.com.au is that right? Ryan: People can head over to iPropertyInvestor.com.au and as Ben said you can click on the US property links and you’d be able to find out with who Ben is working with over in the states. I guess that can help in the terms of the contacts. And obviously if you want to look at this in more details we do suggest reading books and talking to advisors and stuff like that before you go ahead. I’m going to end it there, thank you so much for you time today Ben and for your story and your experience, I think that it’s great for people to hear that you’ve invested using so many different strategies-positive cash flow, capital gains, US property market. Before recording were saying that you even dabbled in stock market and features like that. So it’s exciting to see that even though that you started one way you can actually change investment strategies and still achieve great success. So where to from here for you? Ben: …we’re going to need a bigger place. At the moment I’m living in a one bedroom apartment in the city. So I will rent that out, move bit further, get a bigger property and then I’m off to US in late April. So I should get there in late April and I’ll keep you posted on what happens there Ryan when I get back. Ryan: Yes, we will stay in touch! Thank you and again you guys can check and you can check out Ben on his blog which is iPropertyInvestor.com.au. Thanks for your time Ben and I’ll talk to you later. Ben: Thanks Ryan, I appreciate it. Guys I hope you liked that interview with Ben. As you can see, investing in the US property market isn’t something that we could fully cover in one episode. It is very difficult to understand because it does operate very differently to the Australian market.